A previous mugshot photo of 25-year-old Derrick Hairston, who was wanted for burglarizing a home in Palmdale around Christmas time. 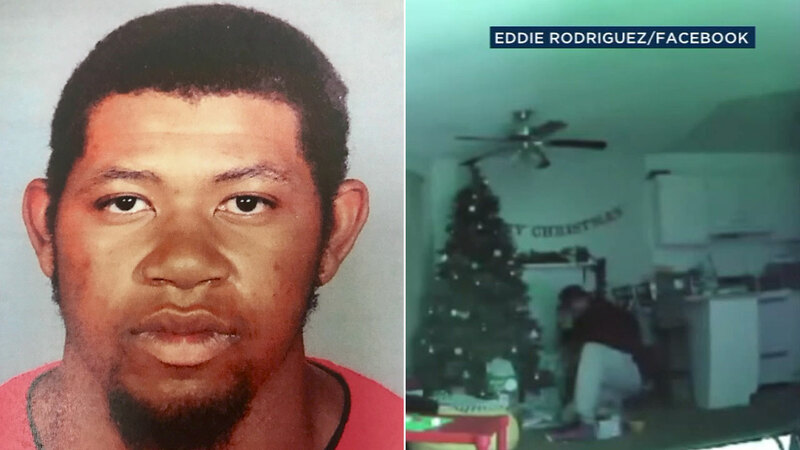 PALMDALE, Calif. (KABC) -- A suspected real-life Grinch who was caught on surveillance video stealing Christmas presents from under the tree of a Palmdale home has been arrested, officials said. The suspect broke into a Palmdale apartment early Christmas Eve and ransacked the home, filling his backpack with gifts from under the tree, a purse, a Playstation 4 and other belongings. The entire break-in was caught on surveillance camera by resident Eddie Rodriguez. Authorities identified the suspect as Palmdale resident Derrick Hairston, 25, and announced his arrest on Thursday. Hairston was arrested around 11:40 a.m. and booked on suspicion of burglary, according to the Los Angeles County Sheriff's Department. He was being held without bail and was scheduled to appear in court Monday in Lancaster. He was already on parole, according to the sheriff's department, but details about his prior conviction were not immediately available. Rodriguez says one of his neighbors was also burglarized and detectives are investigating to see if Hairston may have been connected to other burglaries in the area.